Motocross, a type of motorcycle racing held on off-road dirt tracks, owes its beginnings to the United Kingdom in the early 29th century. Classes of motocross racing include Enduro, Freestyle, SuperMoto, ATV/Quad Motocross, Supercross, Sidecarcross, Pit bikes, and mini-motocross. MX Dubai dirt bike and buggy tour operators offer rentals for off-road desert exploration. Alternatively, if you have your own bike, you can join an organized tag-along tour. Motorbike, buggy, and quad tours are a great way to meet new people, travel safely in a strange land, and pick up a few hints and tricks to try when you’re riding at home. Enduro motocross involves biking long-distance over seriously challenging terrain. Riding in the desert isn’t all about frolicking over gently rolling sand dunes. Remember the ambulance sequences in the 1958 film, “Ice Cold in Alex,” starring John Mills, Anthony Quayle, and Sylvia Sims?” But don’t worry, your skilled guides will do their best to keep you out of trouble, and you’re sure to find an ice-cold beverage at the end of the ride without having to endure all the way to Alexandria. Competitive freestyle motocross, FMX, is a variant of the sport that concentrates on jumps and stunts. 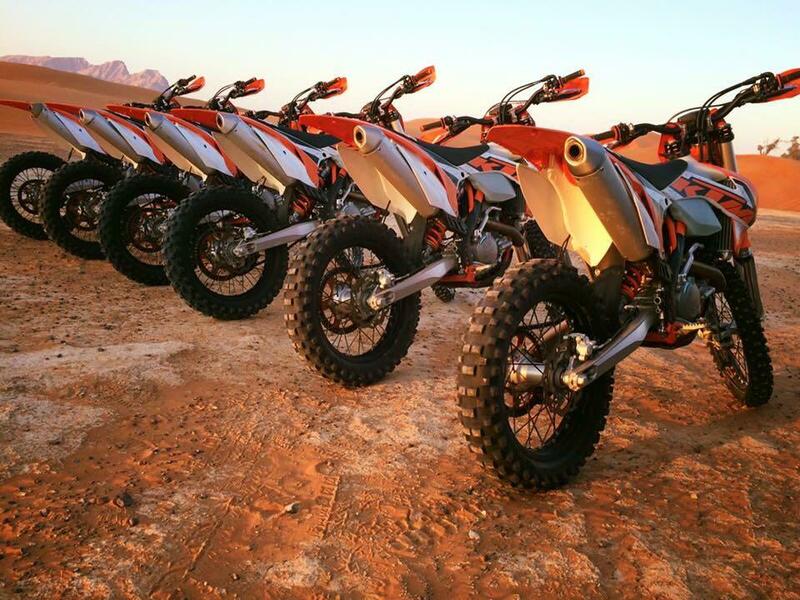 In the beginning, you’ll want to focus mainly on popping simple desert wheelies and modest leaps off small dunes. You can work your way up to more adventurous maneuvers like flips, backflips, and excursions from your seat at heights of up to 40 feet. In the desert, at least, the surface provides a soft landing if you become permanently separated from your bike. For many people, basic motorbike, buggy, and quad bike riding offer enough thrills for their stay in Dubai. The Emirates offer some of the best medical care in the world, but that’s not what you came here to see. Experience the difference between soaring over sand dunes on wheels with sailing through water on a jet ski or flyboard. Riding on a jet ski is sort of like driving a motorbike on water. If it’s your first time, you will learn more, have more fun, and have a safer, more satisfying experience under the guidance of a certified instructor, who will teach you how to pilot your vehicle, show you the most thrilling views and take you to the top spots to stop for a breather and a meal. Gliding over the water is thirsty work and gives you a massive appetite. Often called the sport of the future, flyboarding is something akin to skateboarding on air using water as ‘fuel’. You strap your feet into what looks like chunky platform boots, through which jets of water shoot at speed to propel you as high as 50 feet into the sky, although maybe not right away if this is your first time. Flyboarding also allows you to jet under water, so you can practice your Aquaman routine and keep up with the dolphins. Your guide is there to coach you and steer you into water that is a good 12 feet deep and away from rocks and reefs. A Dubai desert safari can mean anything from a three to six-hour evening tour through the red deserts on the outskirts of the city to a Bedouin camp for a gourmet barbecue. Your journey starts with a dune-bashing 4WD drive, followed by a desert sandboarding experiment and/or a camel ride. If you like, you can change into one of our comfortable traditional costumes. Then sit down with coffee and some dates while you enjoy the entertainment, which might include belly dancing, a fire show and/or a traditional Tanura dance show. Afterward, you’ll have a chance to observe the craft of henna painting, smoke a shisha pipe or take a selfie with a falcon on your shoulder. Feast under the stars on the salad with kebabs or shawarma. If you’ve got the time and want to sample Arabian desert life as it was half a century ago, camp overnight in a tent, where you can sample similar food and entertainment as on the evening tour. However you choose to see Dubai, on the back of a motorbike or quad, in a dune buggy or a 4WD jeep, or from the water, some you might encounter anything from a giant turtle to an Arabian oryx. Other local fauna includes camels and falcons, naturally, not to mention horses and deer. You’ll want to come back again and again.